<?xml:namespace prefix = "o" ns = "urn:schemas-microsoft-com:office:office" />The 3-Roller Monster is meant to compete and win against the best milling products available. 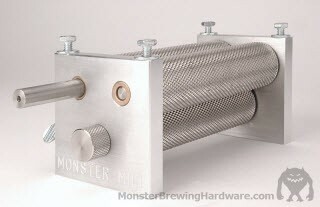 With all the great features of Monster's already popular MM-2 and the addition of a third roller you'll be able to achieve the best crush around at a higher throughput speed. The MM-3 crushes all your grain twice with one pass through the mill. It starts with a preliminary crush through the initial fixed gap between the top two rollers and then ends with a pass through the second gap between the drive roller and the bottom third roller. The initial pass slightly flattens the grain and gets it ready for the next crush that breaks apart the grains and loosens the starch with minimal husk damage.